When users select or click on an optical drive (including CD-ROM, DVD-ROM, CD-RW or DVD RW) on Windows operating system such as Windows Vista, Windows 7, Windows 8, Windows 8.1 and Windows 10 , the drive tray will auto eject or open, and pop up an “Insert disc” dialog box to ask for a CD or DVD media to be placed into the drive. This is a new convenient feature added since Windows Vista, in addition of the previous operating system supported soft-eject option, where users right click on the icon or drive letter of an CD/DVD optical drive and then select “Eject” from the right click context menu does still work. The automatic ejecting of CD or DVD drive tray works only in Windows system newer than Windows Vista. It is not included as part of Windows XP. 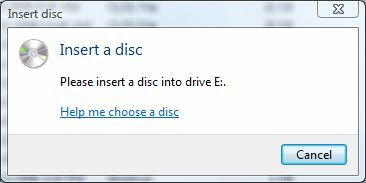 Only DVD RW drive will auto eject and open when clicked on its icon. DVD-ROM drive won’t has the effect. The automatic ejecting will only happen if there is no disc been inserted. If there is already a CD or DVD disc inside the optical drive, double click on the drive will get Windows will auto play the disc to run or play its content, and not eject it. If the disc inside the optical drive is a normal data CD/DVD without autorun.inf which instructs Windows to autoplay, selecting the drive will open Windows Explorer in the optical drive’s folder and lists its files and folders. Thus, Windows will only open your CD-RW and DVD RW drive automatically if there is no disc been inserted yet. If you want to disable this feature, there is a trick to disable or turn off Windows auto eject function, by disabling Windows built-in CD/DVD burning feature, which does not affect ability to burn disc using third party program or burning engine.